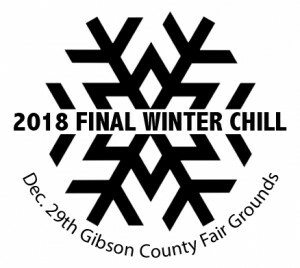 2 round tournament at the Gibson County Fairgrounds. This event will test the temporary layout for the Gibson County Challenge. Baskets will be installed the day before the event. All Ams are playing for Trophies only. Check out the player pack! All Ams will receive a tournament T-Shirt and the first 40 get a stock stamp disc. Klinkers and the Dudes are providing the free lunch. Chili and Taco Soup are the Options! We are also doing a coat drive. Bring a gently used winter coat (youth sizes preferred preferred) we will be donating them to our local organizations. Every player who donates a coat gets entered into 2 special CTP’s for autographed disc. Gibson County Disc Club is responsible for all refunds/cancelations.